At the onset of the Civil War, William Thomas (Cherokee chief, Confederate colonel, state senator) believed in defensive guerrilla warfare and, since the Union army typically outnumbered the Confederate army by more than two-to-one, he wisely opposed the traditional Napoleonic Tactics and even discussed his "defensive only strategy" directly with Confederate president Jefferson Davis himself. Thomas was not a Fire-Eater, he initially opposed secession, and during the war a $5,000 bounty was offered to "anyone that would assassinate the Confederate Chief." The mountaineers, like their "Overmountain Forefathers" during the American Revolution, vehemently believed in a defensive war. Their mountain ancestors proved their defensive strategy by surprising and destroying the British Army at two key southern battles: Kings Mountain and Cowpens. Furthermore, who knew the Western North Carolina geography and topography better than the indigenous Cherokees and Mountaineers? From the beginning of the Civil War, Thomas believed and pleaded with Governors Henry Toole Clark and Zebulon Vance, President Jefferson Davis, and various commanding generals that the mountaineers would be most effective as a locally employed guerrilla unit. Moreover, these highlanders were a unique blend of individuals possessing indepth knowledge and understanding of their region. Because of the lack of western North Carolina defenses, bushwhackers and outlaws reigned and the slaughtering of non-combatants continued, for most of the war, with impunity. Eventually, Governor Vance, President Davis, Generals Martin, Bragg, Buckner, and many others stated that a force similar to the Thomas Legion would have been sufficient for defense of North Carolina's western counties. General Ulysses S. Grant, while traveling through the Cumberland Gap in 1864, noted: "With two brigades of the Army of the Cumberland I could hold that pass against the army which Napoleon led to Moscow." Roman Emperor Hadrian and the world’s greatest military power were brought to their knees by inferior guerrilla bands in the early second century. Because of Rome’s losses to guerrilla raids from the north, it succumbed to a stalemate and constructed a massive wall, known as Hadrian's Wall, to separate the Roman Empire from northern Britain, a location now known as the Scottish Highlands. The Roman Empire never conquered northern Britain, and Hadrian's Wall is considered a great "guerrilla victory." Applying their familiar terrain and home field advantage, King Leonidas and his 300 Spartans, with their Greek allies, defended the Pass of Thermopylae and inflicted at least 20,000 casualties on the invading Persian Army. Prior to surrendering the Army of Northern Virginia, General Lee seriously contemplated disbanding the army, creating a massive guerrilla force, and relocating it to the mountains. And in the twentieth century, the Vietnamese excelled in guerrilla warfare and proved to be a very formidable foe. While Thomas and the Cherokee Battalion were assigned to Western North Carolina, the persuasive colonel recruited dozens of Confederate deserters to the Thomas Legion, but to his dismay, he received a court-martial. Postponing the order was viewed as a cancellation and outright breach of promise to defend the North Carolina mountains. On May 5, 1864, the War Department issued Special Order 105 (O.R., 36, II, pp. 958-959 and O.R., Series 1, Vol. 39, Part II, p. 579), sending Thomas' Legion to Western North Carolina; this action was in response to the deplorable acts of the bushwhackers and outlaws. It was also designed to defend the region against a Union attack. However, Federal movements in the Shenandoah Valley postponed the Order. Subsequently, Thomas' Legion would return to Western North Carolina with Special Order 267 (O.R., 1, 43, Part II, p. 919). During the last months of the Civil War, Confederate General Martin (O.R., 1, 49, Part 1, p. 1048), Union General Stanley (O.R.,1, 49, Part II, p. 309), and Lt. Colonel Stringfield (Histories of the Several Regiments and Battalions from North Carolina in the Great War 1861-1865, Volume 3, p. 761) recorded similar strength for the Thomas Legion. Apart attrition from deaths, diseases, wounds and imprisonment (prisoners of war) sources reflect that most of the Thomas Legion deserters had rejoined the legion. They had previously deserted or returned to Western North Carolina to perform Home Guard duties. They had protected their homes and families during the area's anarchy and, subsequently, had rejoined the legion for the remainder of the War. This legion had been mustered into service with the intent to defend East Tennessee and Western North Carolina. *At the beginning of the Civil War, Thomas' Legion mustered more than 2,500 soldiers. The unit was North Carolina's only legion and it recruited Cherokee Indians and mountain men. Reminding us that strategy is different from tactics (battlefield deployments) and operations (campaigns conducted in pursuit of a strategy), Stoker examines how Abraham Lincoln and Jefferson Davis identified their political goals and worked with their generals to craft the military means to achieve them--or how they often failed to do so. Stoker shows that Davis, despite a West Point education and experience as Secretary of War, failed as a strategist by losing control of the political side of the war. His invasion of Kentucky was a turning point that shifted the loyalties and vast resources of the border states to the Union. Lincoln, in contrast, evolved a clear strategic vision, but he failed for years to make his generals implement it. At the level of generalship, Stoker notes that Robert E. Lee correctly determined the Union's center of gravity, but proved mistaken in his assessment of how to destroy it. 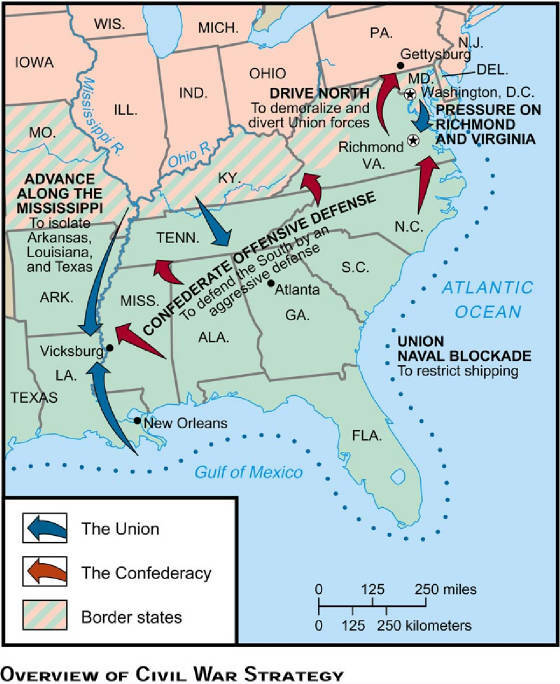 Stoker also presents evidence that the Union could have won the war in 1862, had it followed the grand plan of the much-derided general, George B. McClellan. Historians have often argued that the North's advantages in population and industry ensured certain victory. In The Grand Design, Stoker reasserts the centrality of the overarching military ideas--the strategy--on each side, arguing convincingly that it was strategy that determined the war's outcome. About the Author: Donald Stoker is Professor of Strategy and Policy for the U.S. Naval War College's program at the Naval Postgraduate School in Monterey, California. Colonel Thomas: "The Fighting Cherokee"
Now everything from grand tactics to hand-to-hand combat during our nation’s costliest war is given its proper due in the development of warfare. Nosworthy weaves together the story of newly emerging weapons, the resulting changes in military doctrine, and the combatants’ experiences as these innovations were applied to the battlefield. Detailing methods of warfare from General Irvin McDowell’s first tentative efforts at Bull Run to Lee’s and Grant’s final exertions at Petersburg and Appomattox, the author examines tactical variations due to regional differences and the distinctive circumstances of each campaign. Along with maps, diagrams, and illustrations throughout, The Bloody Crucible of Courage recognizes the primacy of the war’s most compelling voices, and contains hundreds of firsthand accounts from the front lines. Reviews: "Belongs on the shelf of every historian, Civil War buff, and military tactician." -- Maj. James T. Currie, Army. "Provides a fresh and provocative appraisal of the [Civil] War. . . . An essential read for anyone interested in the subject." -- Military History Illustrated. About the Author: Paddy Griffith, formerly a senior lecturer in war studies at the Royal Military Academy at Sandhurst, England, is the author of several other books on military subjects, including Battle Tactics of the Western Front: The British Army's Art of Attack, published by Yale University Press. Numerous maps and photographs allow the reader to better understand and relate to the subjects discussed. It also contains rosters which is an added bonus for researchers and genealogists. Crow, furthermore, left no stone unturned while examining the many facets of the Thomas Legion and his research is conveyed on a level that scores with Civil War students and scholars alike. Also highlighted is Henry Berry Lowery, an Eastern North Carolina Indian, who became known as the Robin Hood of North Carolina. Respected Civil War authors, Thom Hatch and Lawrence Hauptman, help reconstruct these most captivating stories, along with descendants like Cherokee Nation member Jay Hanna, whose great-grandfathers fought for both the Union and the Confederacy. Together, they reveal a new, fresh perspective and the very personal reasons that drew these Native Americans into the fray. Some bushwhackers were highly organized ‘fighting guerrilla units’ while others were a motley group of deserters and outliers, and, since most of them were residents of the region, they were familiar with the terrain and made for a “very formidable foe.” In this work, Trotter does a great job on covering the many facets of the bushwhackers, including their: battles, skirmishes, raids, activities, motives, the outcome, and even the aftermath. This book is also a great source for tracing ancestors during the Civil War; a must have for the family researcher of Southern Appalachia.